The Mangde Chu Basin in Bhutan is home to many alpine lakes, and the number is increasing as glacier retreat leads to both new lakes and expanding lakes. Many of these alpine lakes are impounding by glacial moraines of varying stability. Some of the glacial lakes are capable of outburst floods (GLOF), the resulting hazard has led to an inventory of these lakes in Bhutan and this watershed in a joint effort between Bhutan and EROC in Japan. 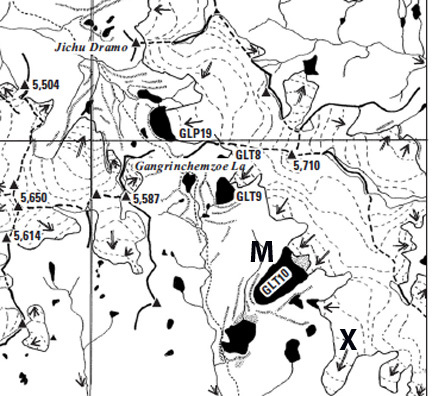 Here we examine the development of a new lake not shown in the USGS map of the region from a 1993 SPOT image. 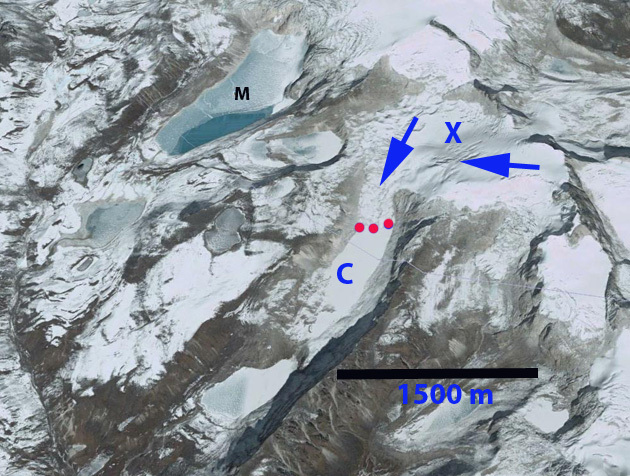 This glacier is marked by an X and is just south of the Methatshota Tsho (M). 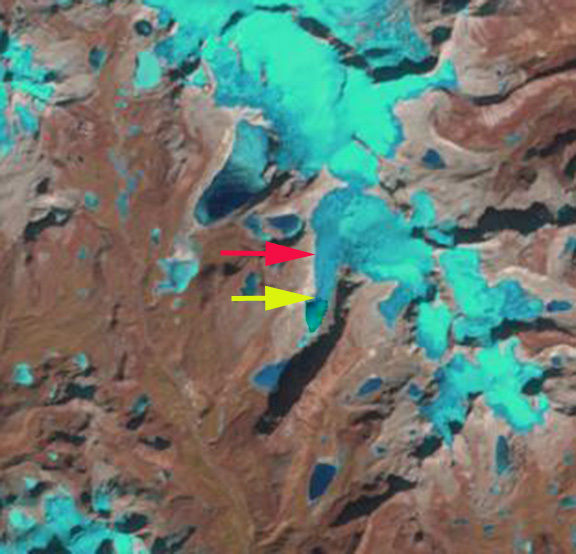 In a pair of Landsat images from October and December of 2000 the lake (C) has formed and the glacier terminates at the yellow arrow, red arrow is 2013 terminus. The lake is 550 m long. By 2006 in the Google Earth image the lake is 850 m long, terminus red dots. 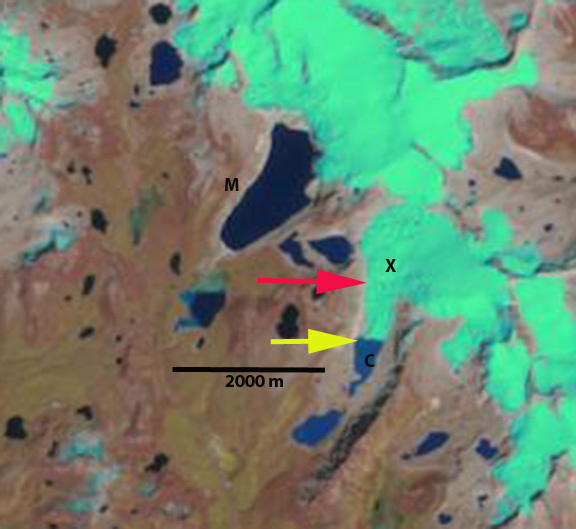 In 2013 Landsat images from October and December indicate the lake has expanded to a length of 1400 m. The glacier has retreated 1400-1500 m since 1993 and 850 m since 2000. 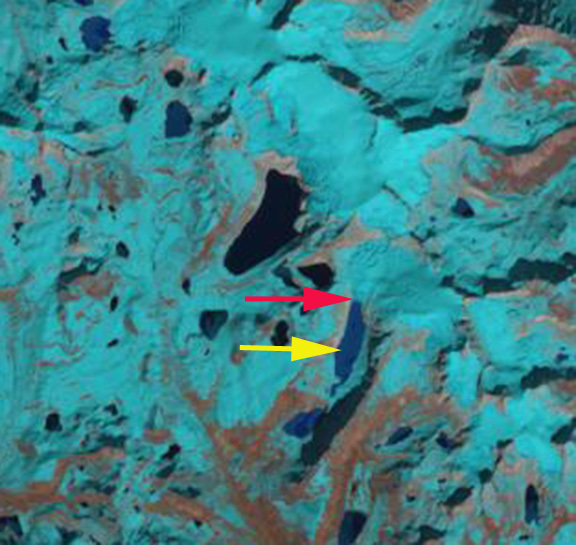 Just above the red arrow the lake to the west of the glacier is not as close to the glacier, this indicates thinning of the upper sections of this glacier and marginal retreat in the accumulation zone. 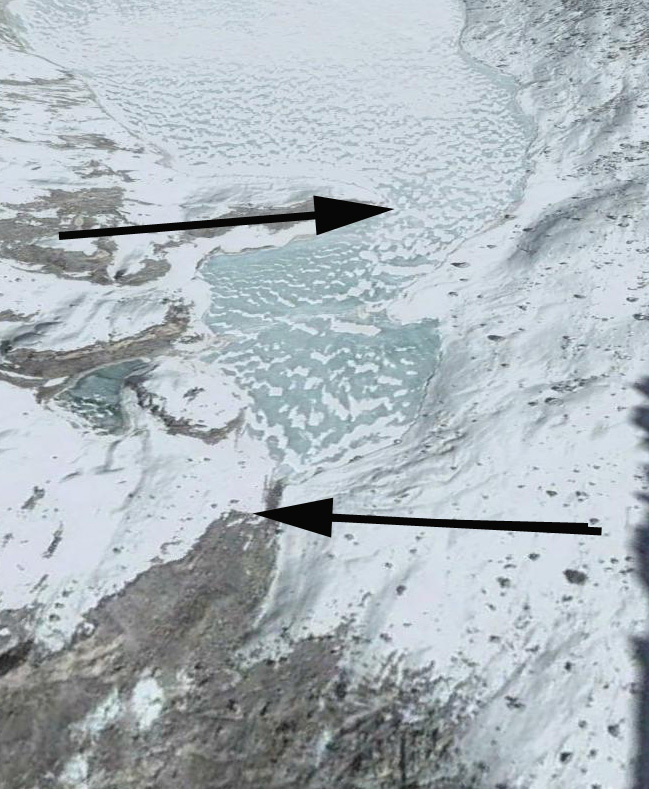 This is typically a sign that a glacier cannot survive current climate (Pelto, 2010). The lake is not impounded by a substantial terminal moraine, and does not appear to be prone to a substantial GLOF. 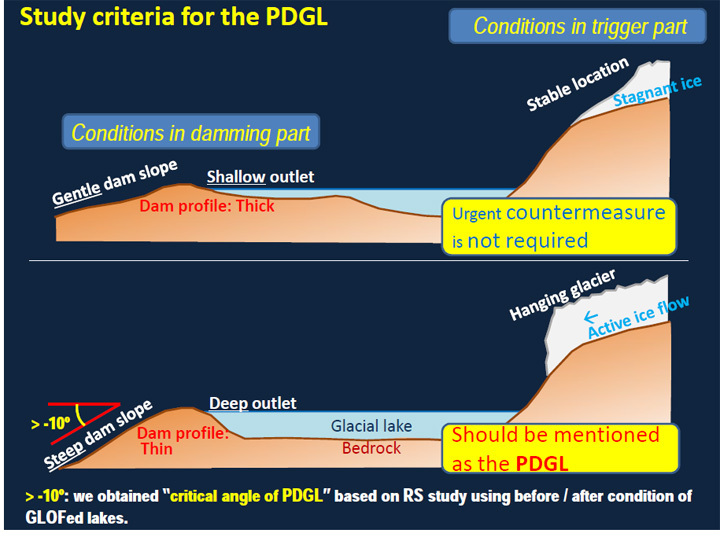 This is what the joint Bhutan-Japan study indicates as not requiring urgent counter measures as the moraine dam is thick and the slope is not too high either of the moraine or the glacier leading into the lake, note last figure. The channel leading out of the lake is immature and will likely downcut through the glacial sediments, reducing the lake area somewhat. 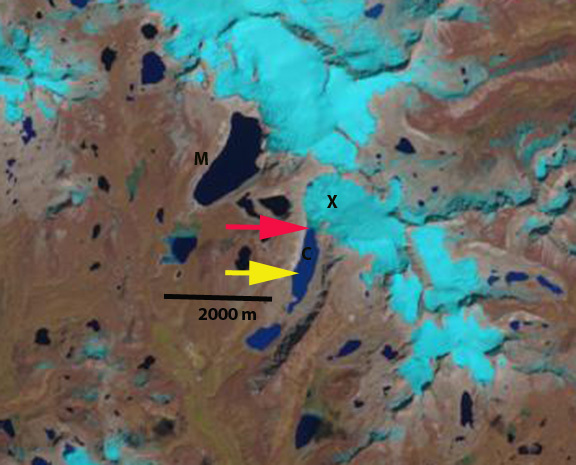 The glacier surface rises quickly just above the current terminus, indicating that the lake will not grow much longer, and glacier retreat will then slow as the terminus pulls out of the lake. This glacier is retreating as are the nearly all glaciers in the region such as Lugge Glacier, Thorhormi Glacier and Theri Kang Glacier all a short distance north. This entry was posted in Glacier Observations and tagged bhutan glacier lakes, bhutan glacier melt, bhutan himalaya glacier retreat, mangde chu glacier retreat. Bookmark the permalink.